Join a global network of local eaters who have challenged themselves, for 10 days, to eat food grown within 100 miles of home, with just 10 exotics (foods from afar we can’t live without). Doing the Challenge, you will wake up to yourself as an eater, to your habits and assumptions, to your rusty cooking skills and the flavors of fresh, to what grows where you are and who grows it – and to the forces at play that keep local food marginalized and local farmers struggling to make a living. 1. Pick your Challenge dates and put them on your calendar. Check out (and “like”!) our Facebook Page to keep in touch. 2. Read our How-To page for specifics. 3. Then Pick Your 10 Exotics. Draw your 100 Mile Circle. Find your Suppliers. Ready. Set. Eat Local. Take charge of your diet. Be nourished by food that breathes the same air, drinks the same water and soaks up the same sun you do. Commit to your place on earth. Create a vibrant food culture. 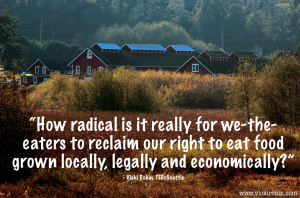 Liberate yourself from almost total dependency on a food system whose bottom line is profit. Surprise yourself. Get radical. Inspire others. This is an experiment. There are no wrong answers. No failures. All experience is information. Your experience matters.